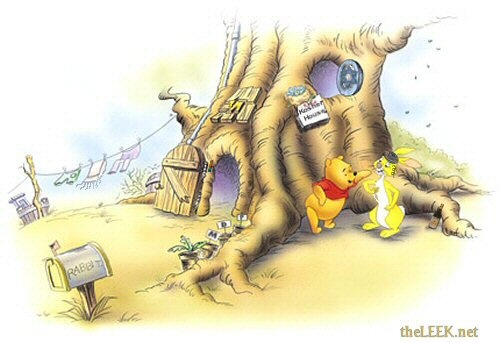 According to a recent study, one of Winnie the Pooh's closest friends, known as 'Rabbit', is Jewish. Rabbit, whose real name is 'Rabbi Tevye' (or 'Rabbi T.' for short) has always kept a kosher home. 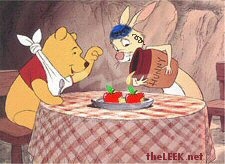 For this reason, he only ate vegetables from his own garden, and was often nervous when Piglet was around. The most significant piece of evidence is the photo below, which contains at least seven clues pointing to the Jewish identity of Rabbi T.
As a practicing Jew, the main challenge Rabbi T. had to face was observing the Mitzvah of eating apples in honey for Rosh Hashanah - the Jewish holiday of the new year, as Winnie the Pooh would devour his honey supply whenever he dropped by for a visit.